Viktor Tsoi (Виктор Цой), KINO - probably the main figure of the soviet underground rock scene during the 1980s. After an obscure period, a fast and overwhelming popularity growth, Tsoi dies in 1990, in a car crash, aged 28. KINO is a band that managed to represent the dissidence of the masses, with no such initial purpose. For USSR Tsoi meant somewhat the same as Kurt Cobain did for the USA. After his death and till now, one can often encounter wall inscriptions saying "V. Tsoi is Alive" ("В. Цой - Жив") all around the former USSR. Rockers, folk-fans, hooligans and many other different categories of people found themselves among KINO's fans. Today, one can label KINO as a post-rock, experimental or minimal rock band, thus a niched band. Yet, it was the most popular band throughout the 1980s, in USSR. It rapidly grew in popularity on account of the honest and straight forward lyrics, depicting the boredom and silent despair of the soviet people. Otherwise, musically speaking, it seems that KINO's music simple tunes resist much better in time, than any other of the soviet underground bands. Before and after the concert, we shall listen to records of KINO and many other soviet/Russian language rock bands, such as Nautilus Pompilius, DDT, Mashina Vremeni, Akvarium, Krematory, Megapolis, Voskresenie. 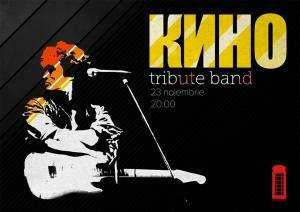 "Tribute KINO live! @ Londophone" Concert in Bucharest. You can get here description, reviews, address, time and details of "Tribute KINO live! @ Londophone" Concert in Bucharest. Visit Bucharest Tips for more Concert events in Bucharest!